The proportion of homes let by a company landlord rather than an individual rose to 18% in H1 2018, the highest proportion since our records began in 2010 ( see table 1). This is up 4% on H1 2017 and up 8% since H1 2016 when just one in ten homes were let by a company landlord. The numbers have been steadily rising since H1 2015 when the Chancellor announced changes to tax relief on rental properties in the 2015 Spring Budget. The changes meant that it became more tax efficient, in some cases, for landlords to own their buy-to-let portfolios through a company rather than hold as a personal asset. 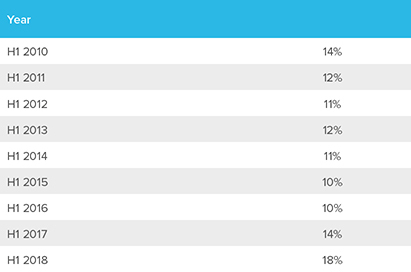 Yorkshire and the Humber interestingly had the highest proportion of rented homes owned by a company landlord. 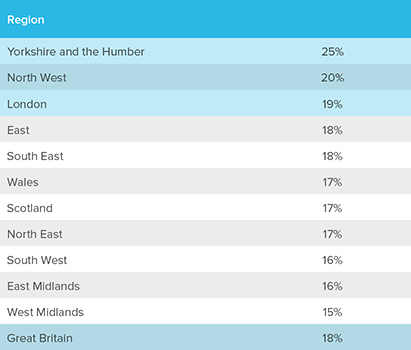 One in four (25%) homes let in Yorkshire and the Humber in H1 2018 were owned by a company landlord, followed by one in five (20%) in the North West and 19% in London (table 2). Last year, London topped the list but has since fallen back. Company landlords are more likely to rent out cheaper homes than individual landlords. Over a third (35%) of homes let by a company landlord cost under £500 pcm, compared to 19% of homes let by individuals (table 3), whilst individual landlords had a higher proportion of homes with a rental value of between £500-1500. One in ten rented homes owned by a company landlord were registered overseas. 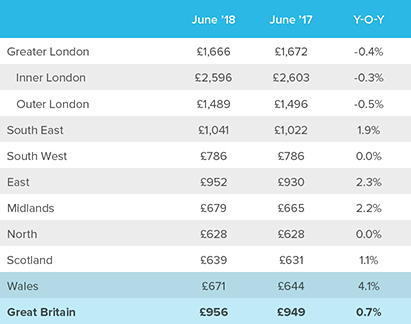 The average cost of a new let in Great Britain rose to £956 pcm in June 2018, an increase of 0.7% (table 4). Rents rose the most in Wales, up 4.1% year-on-year, followed by the East (2.3%) and the Midlands (2.2%). Rents in the North were the same as they were this time last year which is positive given that they had fallen in the previous 2 months. “The number of rented homes owned by company landlords continues to rise. Nearly one in five homes let so far this year were owned by a company landlord, almost double the proportion in 2015, before the tapering of mortgage interest tax relief changes were announced. Companies are generally taxed more favourably, so in many cases landlords can make cash savings by operating through a company rather than as an individual. Dan Taylor addressed a City of York Council executive meeting before members agreed to 550 homes being built over the next five years, with the authority’s own housing department running the project instead of a specific housing development company. He said: “The cries for more affordable housing in York are loud and numerous. He said the council had the chance to be in control and must take it to ensure the housing balance which had been tipped towards the rich and student accommodation returned to a more equitable state. Under the council’s plan, former school sites at Lowfields and Burnholme are in line for development, along with old schools and care homes and the disused Askham Bar Park & Ride car park. Officers said that if the authority builds homes itself, it can build the two to three bed family homes York needs, and ensure 40 per cent are deemed ‘affordable’.